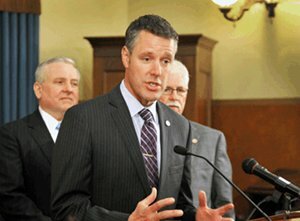 LANSING, MI- State Senator John Proos is backing new legislation that would give divorce judges the power to order a change of custody for children when they perceive a risk of parental abduction. Proos says that, sometimes, a parent will kidnap a child when the divorce isn’t going smoothly. This plan would let judges evaluate possible risk factors and respond accordingly. Risk factors for parental abduction might include previous threats to do so, or recent actions to get a passport. The new law would let a judge order prevention measures like imposing travel restrictions or placing the child’s name in the US Department of State’s Child Passport Issuance Alert Program, in addition to the possible custody changes. This entry was posted in Uncategorized and tagged 2013, Abducted, Abduction, Abroad, child, children, Custody, International, John Proos, July 13, kidnapped, Kidnappings, Kidnaps, Parental, Parental Abduction, Recover, risk, Senator John Proos, what to do. Bookmark the permalink.